EVP recording has the words "I'm pissed off"
One of the voice recordings with a whispering voice stating "Stupid Soul"
First and fore most this is a story of a connection between my son Jeremy and myself that continues after his death. I created afterdarkclub.com to study and reveal all sorts of phenomenon. As my son got older he too became interested in finding the strange and unusual. Little did I know that my greatest validation that there is a conscious existence and a willful connection beyond this world would be brought to me by my beloved son Jeremy Orion Passon. My son had gotten involved with the wrong people. He developed a drug addiction and was exposed to many bad things as a result of it. He came to live with me after drug rehabilitation and without my knowledge became reacquainted with the worst of the people he could be involved with. What appeared to be a drug over dose the morning that I found him now appears to be murder. His phone shows evidence that he was sneaking out and meeting with certain individuals who eventually injected him and placed his body into my home. I do not wish to disclose any details more than this as it is still under investigation. Several days after his death I was visited by one of Jeremy’s friends that lives in my neighborhood. He had asked; “Have you looked with an EVP or camera to see if Jeremy is still around”? I replied I have not. So we used cameras first to see if there was any sign of my son. I recorded a bright orb that followed and passed my son’s friend. I showed him the recording and we both got together the next evening to use the EVP recorder and cameras. Although I have done this numerous times before, This was my son that I was seeking and apparently getting evidence from. I found it more comforting than adventurous. The next evening we placed an EVP recorder on the floor of my bathroom where I found his body. I had asked; “ Jeremy, do you know what I felt and what I went through when I came downstairs and found your dead body? Do you realize what I went through attempting CPR and mouth to mouth. Hearing bubbling from your chest"? I continue and have continued to record and photograph events ever since. This is why I have not updated afterdarkclub. Some recordings and images I will share here, others I choose to keep private. A month after my son’s passing I was approached on Facebook by a man who stated that both our children were hurt by the same person but in different ways. He wanted to explain further in person. I went to his home to discuss details. Before I left him, I told him of the events that I was experiencing and recording. His home has 60 cameras that cover the entire property inside and on the grounds. I stated do not be surprised if you see a bright orb, or some other strange events. In the early morning hours, I received a text with a video. A security camera that covered his front property and driveway shows a bright orb moving around the time and date of his video. Over time what appears to be my son as a white orb has evolved into a bright blue light. Not always round. It changes shapes, mimics things around it, and at times is very large. It has been recorded in video and photographs both n the bright sun light and in total darkness. This man has also seen my son as a blue orb and sent me a video of that event too. 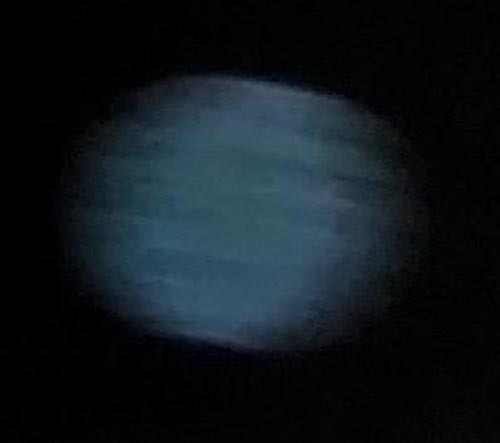 Blue orb with face. Look closely and you will see lips, a nose, eyes and brow above the eye to the right. I bought a piece of furniture that now contains my Mother’s, my Fathers, and my Son’s urns. I have placed personal items of theirs and included photos of other relatives that have died. Every time that I am home I light candles. There was one week that I was audio recording. I used several different recorders and different software. For three evenings I was recording and captured what sounded like a heavy door opening, whispers stating “Stupid Soul”. The whispers were repeated many times and followed what sounded like a door closing. The fourth night I stated out loud that you are not a stupid soul. You were a stupid or foolish person but now you are smarter. I had asked is there anything that you want to say. This was June 23, 2017. On that audio I have the sounds that accrued on May 17, 2017. I can be heard yelling and cursing. At the time I thought that he was just under the influence and he would be fine. Then the sounds of my wife who came down when she heard me yelling. So the answer to my question was the sounds of me and my wife. I can only believe that the soul of my son was there watching. Again the date on the tablet that was used shows June 23, and the sounds were from more than a month earlier. As mentioned the urns are in a furniture cabinet. This cabinet is in a room that my PC is in and a room that I spend a lot of time in. The bathroom in which he died is connected to it and the paramedics worked on his body on the floor of this room. One evening I and my 9-year-old daughter were watching TV shows that Jeremy liked. She wrapped herself in a blanket that has the SpongeBob cartoon character on it. Before we went upstairs for the night, I had suggested that we try to video her brother. So we straightened up and put things away first, The blanket was removed from the room. On a video I asked if Jeremy could let us know that he was there. As we were talking I recorded a whispering voice that was equally loud to ours saying “SpongeBob”. It was only picked up on the recording. Over time I have captured so much. Terabytes of information. The most recent was me speaking to Jeremy asking “Can you let me know that you are here with me”? I was not getting any images on video. As soon as I asked three loud hard bangs occurred on the wall behind the urns. I recorded this. I went upstairs to see if it was either of my two daughters or perhaps my wife who went to bed earlier. They were all asleep. 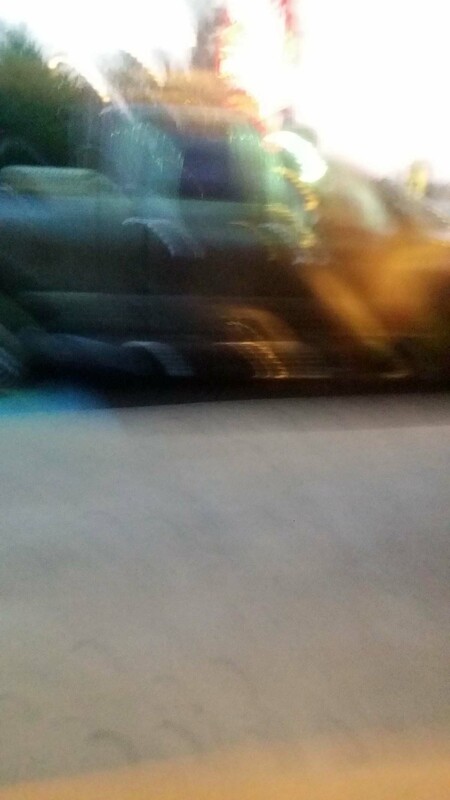 I had captured a full apparition and did not even know it. I was looking through some of the many videos when I paused the computer to put slippers on my feet. My 9-year-old asked what’s that daddy? I moved the video frame by frame then back and forth. My son had ear studs and a pair of black sneakers with bright white reflective markings. He had been leaning on a wall, just passed the entrance of the living room and walked two steps until out of sight of the entrance. As he moved the top part vanished blending with a street light from out side. On that recording I went into that room and circled around. It shows that no on was in the room with me. There is so much I could speak about. He has helped me find things. In August I could not find short pants to wear to the shore and I was complaining about it. A few moments later the shorts were laying on my bed. He has contacted other people through visual, audio, and smells. One night my wife and I were awoken up from a yell within my bedroom and yet my daughters heard nothing. My point in my writings is not to entertain. My point is that YES, we have a connection that spans beyond this world that we know. Death in a way is an illusion. Not each and every time that I set out to record do I get something. Most of the time I do. Others have their own events that they believe its my son. I miss my son beyond any words that I could use to describe. However, I am comforted knowing that somehow, he is still with me. Jeremy almost died at birth. Both he and his maternal Mom flat lined and by some miracle they both lived. I tried CPR and mouth to mouth resuscitation when I found him on the morning of May 17th. He is the only person who I was there at the birth – life- and death. I was closer to him than anyone else in this world. Whether I live one more day or a 100 years, I will always speak out to him and look for his presence. 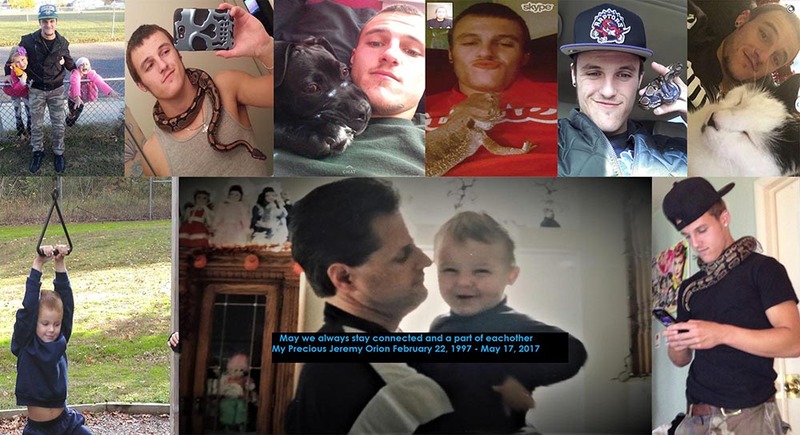 He loved his family, life and all animals. I don't understand why this has happened, We spoke every day for 21 years except once when I was in a car accident and once when I was out of the Country and had not gotten a phone. My loss is great as many parents unfortunately have also experience. I am however surviving better knowing that from time to time everyday he lets me know that he is around. The most bizarre way that he reached out was a photograph. I was going to video record and took a still photo instead. When I went back to look I was amazed. My son slept on my couch. The photo was taken at night. Yet in the picture several things are being shown. On the right side appears to be my son's head laying on the arm of the couch. There are trees and the sky on the left side. My Dodge truck in blended with the couch. There appears to be a bearded person with his arms crossed sitting in the middle and legs straight. Jeremy had a black dog named Bruiser. A black dog can be seen. There are several other faces as well. Perhaps relatives and friends who have passed on. This photo was taken in low light with no flash at a tan couch on a tan rug.